At Green Touch Landscapes we believe that art is humanity’s interpretation of nature and the beauty that abounds in nature has always been the muse for our designs. We combine our years of experience and knowledge of Denver landscaping with your vision to design and build the landscape of your dreams. The Green Touch Landscapes staff is unique in that horticulture has been our life passion. We feel truly lucky to be in a profession that allows us to serve both people and nature. 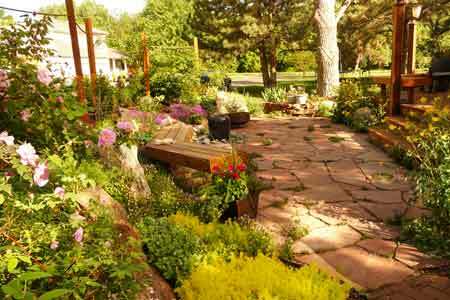 Green Touch Landscapes is Family owned and operated in the Denver/Littleton area and has 20 years experience. Our designers bring a lifetime’s experience of working with beautiful Colorado landscapes. This design skill combined with our years of gardening and landscape maintenance allows us to see what succeeds and what doesn’t in our Colorado ecology. We have literally been in tens of thousands of yards in Denver. We firmly believe that our sites are designed to stand the test of time and climate. Our landscapes are designed to work with demands of every Colorado season and maintain their beauty year after year. After you contact us, we will consult with you about your landscape and project. Based on the scope of the design, we will give you a quote, which will include a detailed installation proposal. If you decide to have Green Touch Landscapes install the design, the design fee will be returned to you after project completion. Green Touch Landscapes will then schedule and install the design. Of course, the installation of the landscape is only as good as the staff onsite. We pride ourselves on the quality and knowledge of our people. As with the owners, Green Touch Landscapes employees are plant people who have chosen landscape design and installation as their career.